So as part of my discovery with the new car, I now know why the sat nav appeared VERY useless....it is seemingly not picking up any satellites. I bet this is related to a windscreen change and I also bet they have butchered the blue connector. Has anyone switched this out? As it appears to be very specific i.e integrating the metal coax plug into the unit and out the side. I have scoured google with no luck. I am still trying to get hold of the previous owner to get the windscreen company to fix this but he seems to have vanished , but for what is no doubt a few quid....I would like to get a spare on order as I bet they will be clueless/not have it when they do come out. The Only time i ever replace a gps lead or antenna is after a windscreen has been fitted .. sigh . It all depends on 2 things ..
Can you actually get the blue part of the connector ..
Is the center pin damaged / out of alighnment .. often the broken connector has been jammed back in and damages this part or even the gps antenna. Worst way .. new gps and a new lead will need to be run to the nav unit. Really quite annoying isn't it, I simply cannot understand the sloppyness on jobs such as these. It seems those right angled blue Fakra casings are like unicorns. 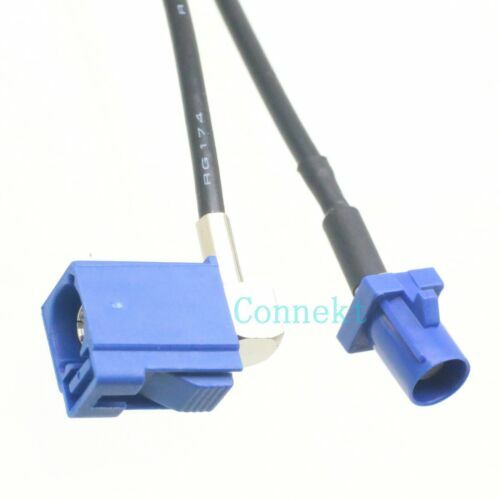 The extension piece .. you can remove the blue connector from it and fit to your old lead .. if the cost isnt high then thats worth a shot. Windscreen fitters dont realise this is fixed to the panel .. they just pull to remove it and then find this lead .. these break pretty easily so by the time they have found it its already too late . Ive been replacing these for at least 8 years due to this . Its only about £4 from China, seems to be the only supplier of it regardless of price ! For £4 then buy it and see if it can be repaired , fitted to fix this . Absolutely, at that cash have got it ordered in case this is the problem. Saves grief later. This is where I found the cable..